A giant nest built by up to 10,000 stinging wasps have been discovered in an abandoned loft space. The nest was allowed to reach close to its maximum size because the property in question, in the sleepy country village of Pipewell in Northamptonshire, has been unoccupied for several years. 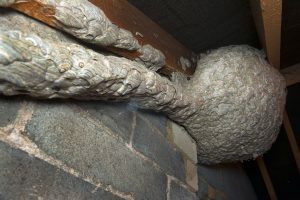 The nest is rare not only because of its size, but because the wasps built an intricate tunnel from the nest to the outside, which is perfectly preserved. It was discovered by pest controllers treating an established woodworm problem prior to the new owners moving in. Carcasses of hundreds of dead wasps found next to the nest indicate that the colony was created by the common wasp (Vespula Vulgaris). However people in the UK have been asked to be on the lookout for the larger Asian Giant Hornet which has been heading north across Europe. The Asian Hornet is even more aggressive than the common wasp, has a darker thorax and its stings have caused a number of deaths in countries as near to the UK as France through anaphylactic shock. Anyone who thinks they have seen an Asian Hornet is asked to report the sighting to the Bee Keepers Association. A spokesman for the British Natural History Museum commented: “Sometimes wasps just build on surfaces around the nest like this. There was a great example doing the rounds a few years ago, of a wasp nest that consumed a wooden statue. The ‘tunnel’ won’t be used for rearing young. I doubt it will be used as an entrance/exit either but it might conceivably be an extension of the original entrance hole. Colin Campbell, who is the insect infestation specialist for Pest Professionals, said: “Although not the most loved of our flying insects by a long chalk, for obvious reasons, wasps are fascinating creatures. The nest is built around a single queen and really big nests like this can readily number 6,000 to 10,000 individuals. This one would certainly have been on the higher side of those numbers. “They grow through a complex symbiosis between the worker wasps, which bring food to the grubs produced by the queen, and the grubs themselves, which secrete a sugary substance on which the workers feed. One is dependent on the other. “It’s when the queen stops producing the grubs, usually in the late summer, the workers become a real pest. With no sugar being produced by the nest, the workers go out in search of their own sugar – ice creams, sugary drinks, beer and the like. Only queen wasps survive the winter, and it’s thought that over 90 per cent of them are predated while hibernating by spiders – so the message is, ‘love spiders’! Wasps prefer sharp seasons so that the queens know when to come out of hibernation. Mild, wet winters confuse them into emerging too soon and before there is enough nectar about to survive. When wasps find a food source they convey the location to the whole colony a complex ‘dance’. The workers then visit it until it’s exhausted.